Long before he starred on some of television's most beloved and long-running series such as Taxi and Who's the Boss? and went on to distinguish himself in a variety of film and stage roles, Tony Danza was a walking contradiction: an indifferent student who dreamed of being a teacher. Inspiring a classroom of students was an aspiration he put aside for decades until one day it seemed that the most meaningful thing he could do was give his dream a shot. What followed was a year spent teaching tenth-grade English at Northeast High - Philadelphia's largest high school with 3,600 students. Entering Northeast's crowded halls in September 2009, Tony found his way to a classroom filled with twenty-six students who were determined not to cut him any slack. They cared nothing about "Mr. Danza's" showbiz credentials, and they immediately put him on the hot seat. It was only after experiencing abject terror for several weeks - and even dissolving into tears on several occasions - that Tony began to pick up the tricks of how to get kids to learn. Featuring indelible portraits of students and teachers alike, I'd Like to Apologize to Every Teacher I Ever Had reveals just how hard it is to keep today's technologically savvy - and often alienated - students engaged, how impressively committed most teachers are, and the outsized role counseling plays in a teacher's day, given the psychological burdens many students carry. 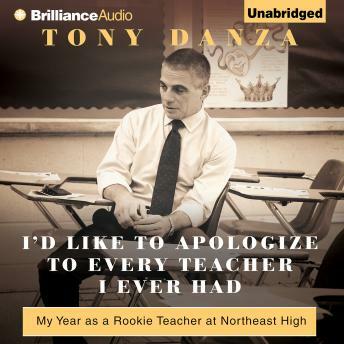 The audiobook also makes vivid how a modern high school works, showing Tony in a myriad of roles - from lecturing on To Kill a Mockingbird to coaching the football team, organizing a talent show, leading far-flung field trips, and hosting teacher gripe sessions. Inevitably, Tony's students steal their way into our hearts - in a way that always feels authentic. A surprisingly poignant account, I'd Like to Apologize to Every Teacher I Ever Had is sometimes laugh-out-loud funny but is mostly filled with hard-won wisdom and feel-good tears.